Event Co-Chairs Rosalee Bogo, and Phyllis Seaman, welcomed over 100 guests! We are pleased and proud to announce we have many new Major Donors and 15 new Lions of Judah. Karen Deutsch, Campaign Chair, shared with everyone the success of our 2019 Annual Campaign to date, and expressed the ongoing needs of our community. 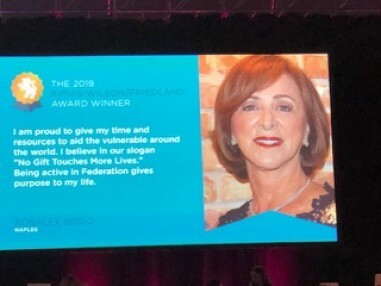 We honored Rosalee Bogo as this year’s Kipnis-Wilson/Friedland Awardee, and announced many new and exciting changes happening at the Jewish Federation of Greater Naples. Guests enjoyed a dining experience by Crave Culinaire and entertainment by local celebrity musician Matty Jollie, featuring favorites by classic legends, Frank Sinatra, Dean Martin and Michael Buble. 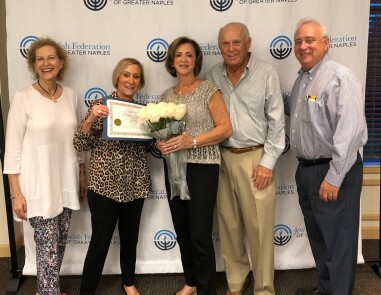 Thank you to all of our guests for your continued support of the Jewish Federation of Greater Naples and our community. We hope you had a great time and will join us again next year. Click here to see Majors/Lions of Judah 2018 pictures. Click here to see Majors/Lion of Judah 2015 photos. Click here to see Majors/Lions of Judah 2017 photos. In 2017, our very own Phyllis Seaman was recognized as the award recipient. Rosalee Bogo at the International Lion of Judah Conference as the 2019 Kipnis-Wilson/Friedland Awardee. International Lion of Judah Conference. Pictured left to right: Karen Deutsch, Phyllis Seaman, Goldie Bertone, Jane Schiff, Rosalee Bogo, Marcia Cohodes, Lisa Ratner and Paula Filler.